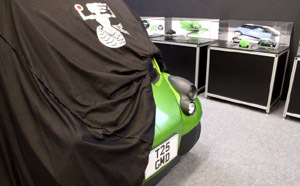 Gordon Murray's T25 To Come From Apple, Virgin or Sony? Gordon Murray is, for a car designer, about as successful and famous as a car designer can be. He first gained notoriety by making radical, and winning, Grand Prix race cars for Brabham (including the mind-blowing BT46). Then he moved on to making even more impressive race cars for McLaren. That wasn’t enough, so he designed the revolutionary McLaren F1 three-seat supercar. So when you’ve done all that, what’s next? How do you top yourself now Murray? In a completely unorthodox and lateral move, he started working on the T25 city car that was not associated with any manufacturer. True to his nature, the word was that the T25 was to be a revolutionary small, light, inexpensive and eco-conscious and the McLaren F1 was fast. And now comes word that who produces the car is almost an academic concern to Gordon Murray, but it could be someone like Virgin or Sony or Apple. Yes, that Apple. Murray recently commented on the T25s production in the press this way: “We’ve had 20 inquiries from 15 different countries; only seven are existing car producers. We’ve had governments saying “we need a car for our cities.” He also stated that he thinks the car could just as easily be produced by a concern that has nothing to do with traditional auto manufacturing, and that he ” … could start seeing cars coming from brand owners like Apple or Virgin or Sony.” He also said that the T25 will come with a 660cc engine via from Mitsubishi that will be either turbocharged or naturally aspirated, and in the future will see hybrid and electric powertrains. Sure, I could see that distribution deal happening. It sounds like something Richard Branson would do, although I’d think twice about endorsing the Sony end of things. It’s that Apple thing that is the most puzzling. For quite a while now, people have been saying that Jobs or Apple, or both were somehow going to get into the car game. I’ve read rumors about Tesla, and rumors about Aptera, and rumors about this company or that company or even internally from Cupertino. It always sounded like just the pipe dreams and wishful thinking of Apple fan-boys … but this time around, if Gordon Murray is correct about how producible the T25 is, those rumors might turn out to be true. Whoa! A non-car company, like Apple or Virgin, might start producing cars? Somebody is ready to upset the apple cart.